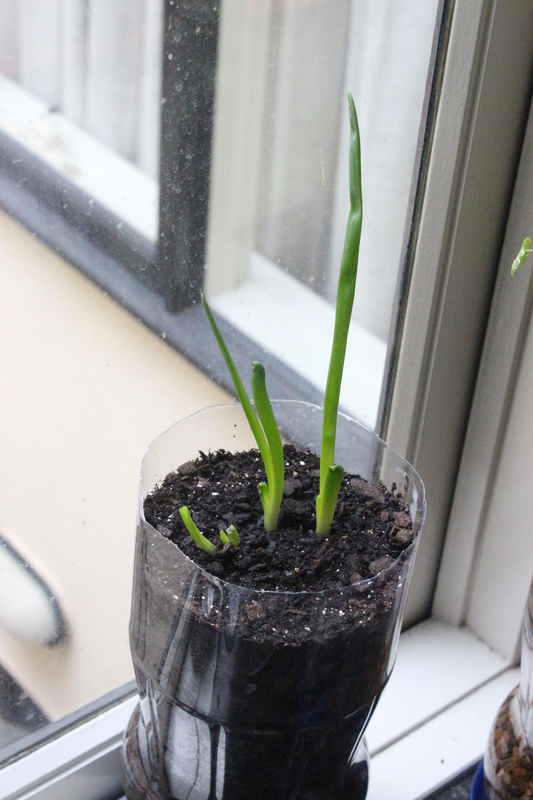 A series for planting if you very limited space to garden with – a window sill, balcony, terrace or courtyard for example. For today’s issue, I want to look at fresh herbs. 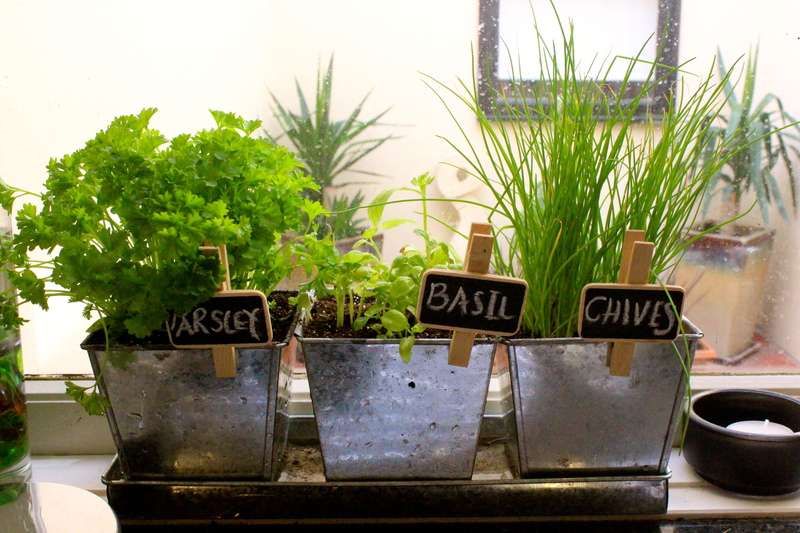 The best way to have fresh herbs is to grow them from scratch, but the easiest way is to buy them already grown. Today’s issue is about how to keep the herbs healthy while you eat them, rather than letting them slowly rot in your refrigerator. 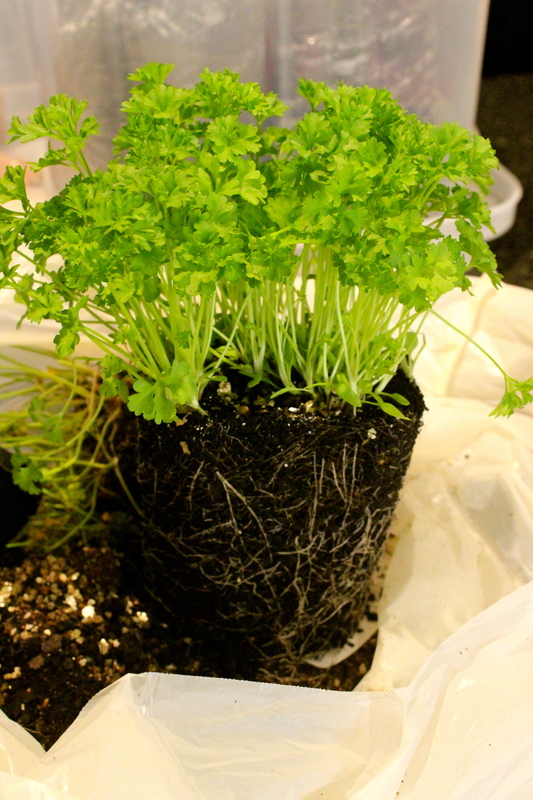 I’m going to start on the last herb I planted – parsley. I’ve used it all up so it’s time to plant a new lot. I purchased the plant from a supermarket and I already had a pot lying around. This is really about how you repot them so you can use them daily. 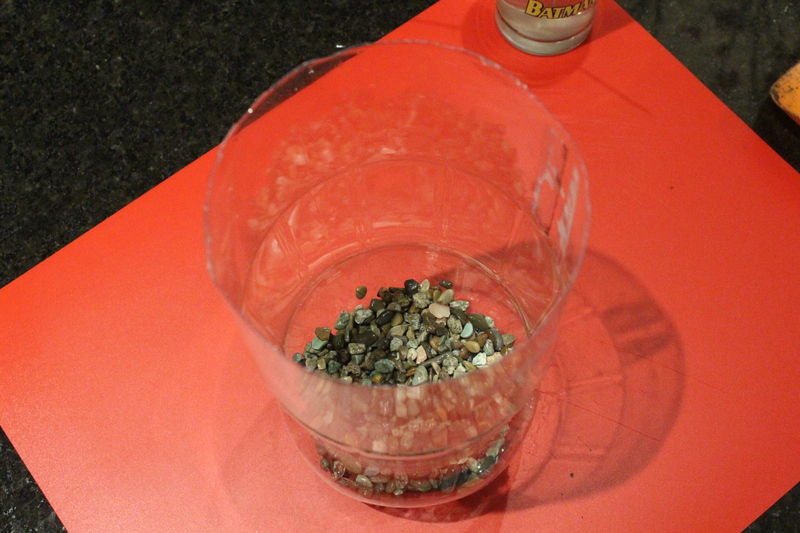 Next, get some small rocks – I bought bonsai rocks, but any small rocks will do – and cover the bottom of the pot with them. 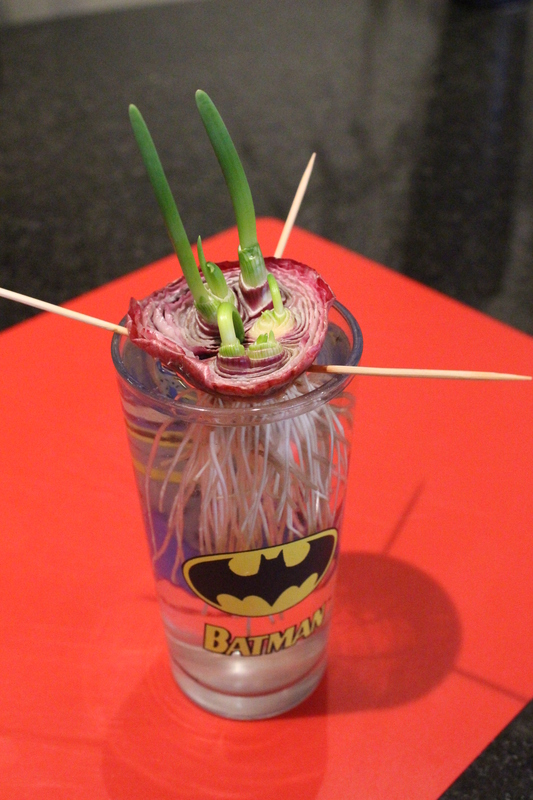 This will give your plant great drainage and stop the roots from rotting. Put in enough soil to cover the rocks and a little more. Normal potting mix is fine, and of course you can use the soil I spoke about in the last issue of Terrace Plant Thursday. 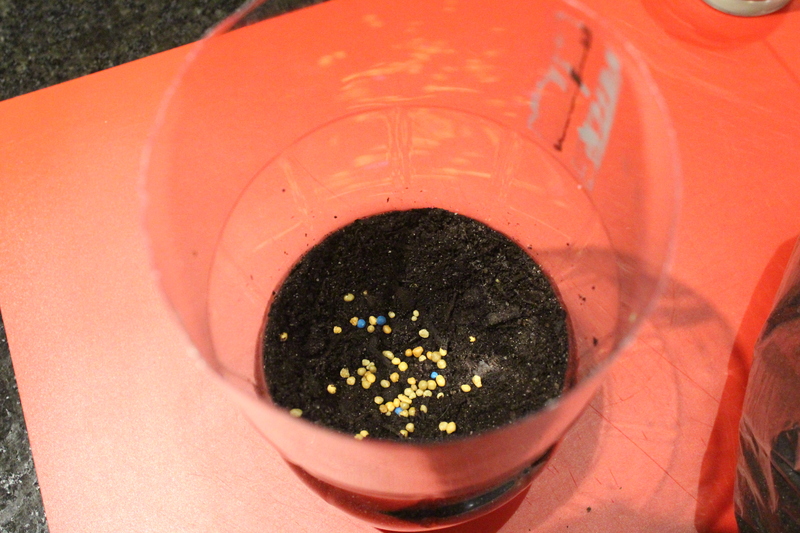 On top of the soil, place some slow release fertiliser. I use Osmocote (pictured) but anything similar is fine. Not too much, just follow the instructions on the package. 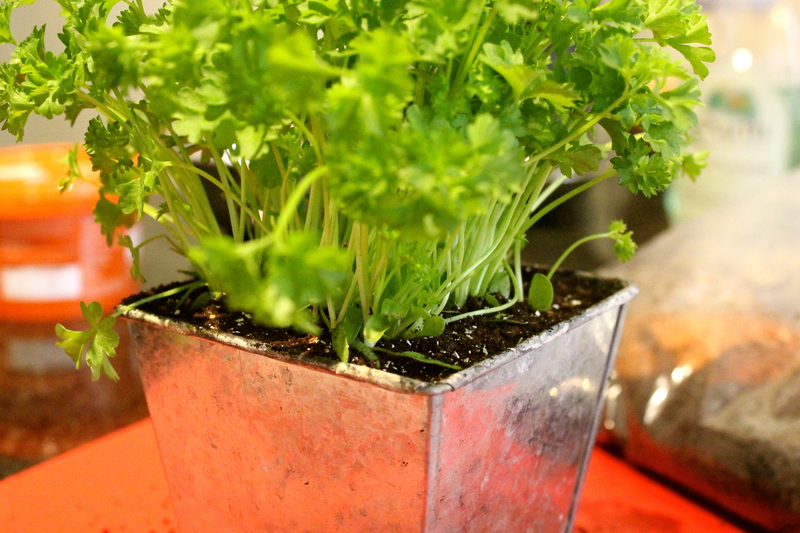 The herbs you buy usually come in plastic “stock” pots that usually leave the plant root bound. 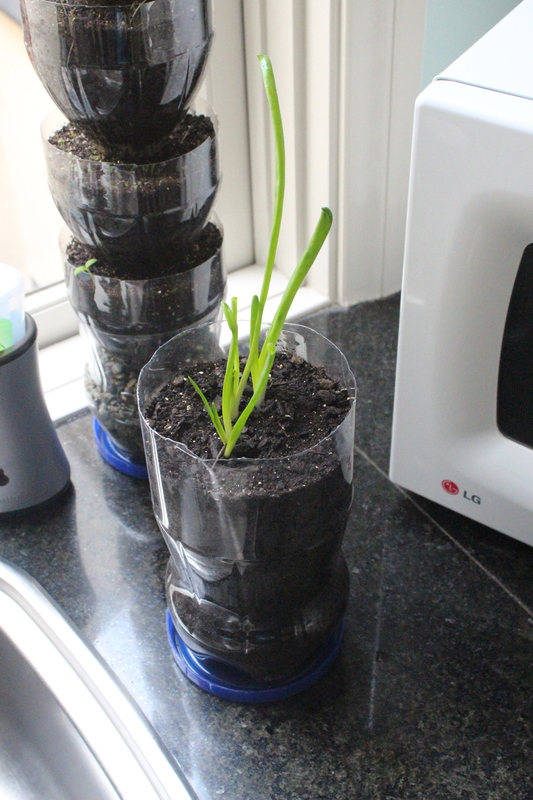 Take the plant out of the plastic pot. 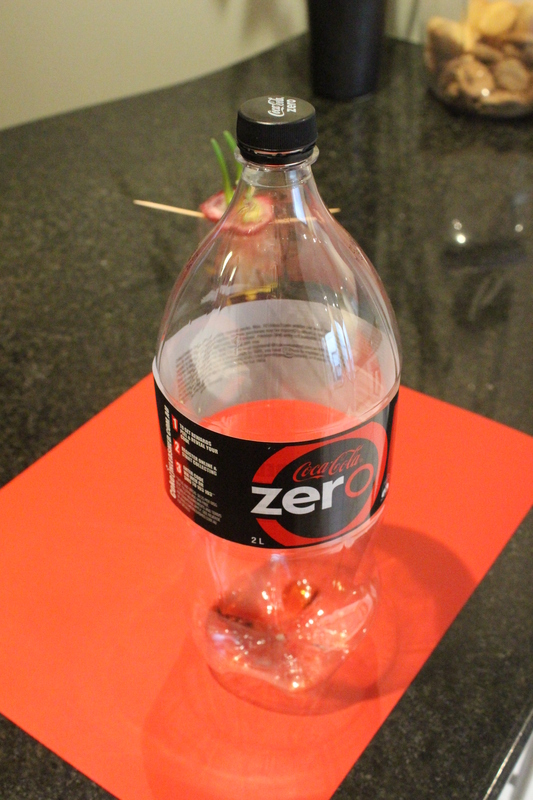 You may see in the photo, I’ve laid down a plastic bag – this makes things so much easier to clean up afterwards. 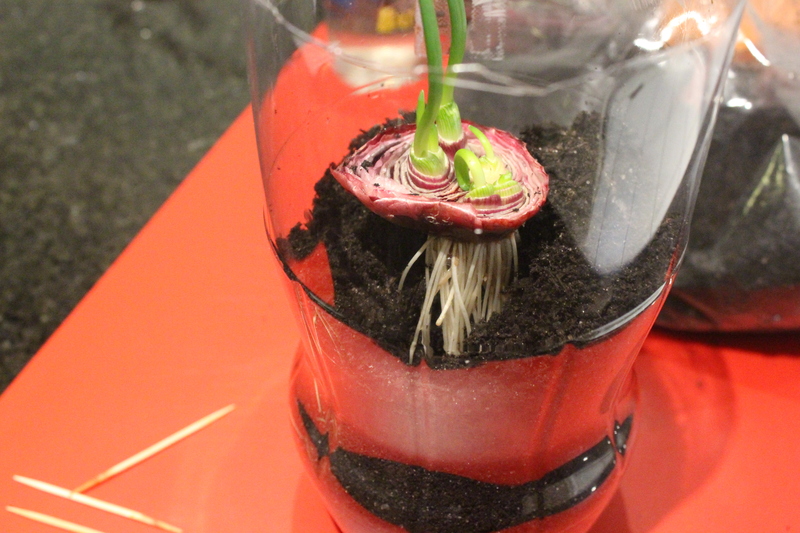 Separate the roots and get rid of some excess soil down there. 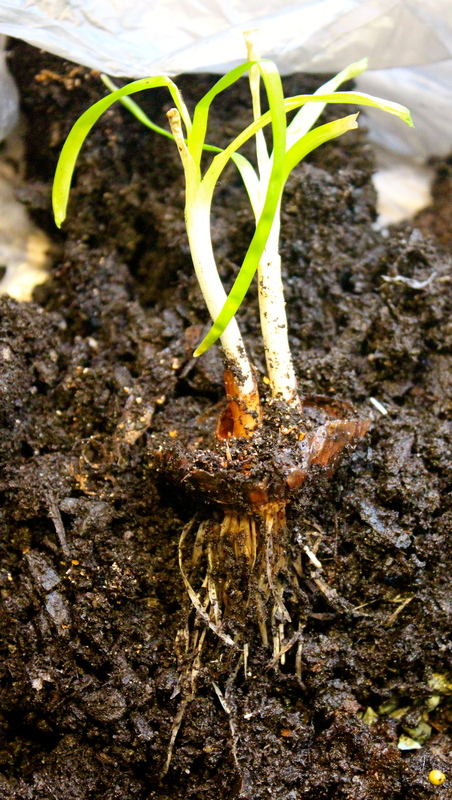 It doesn’t matter if you rip some of the roots out – new ones will grow. We just want to give the plant some room to breathe and grow. Okay, this is the easy part. Get the plant and smoosh it into the pot. You won’t hurt it! Just get in in there! Push it down so it’s firmly in the pot. 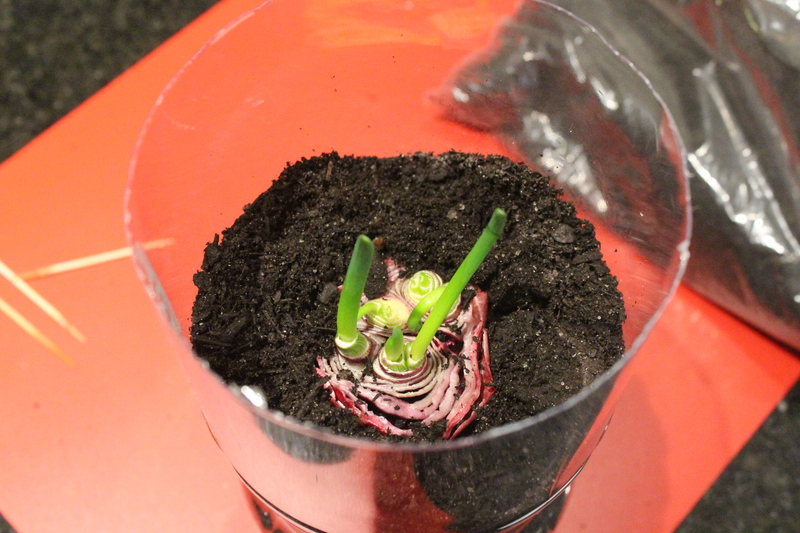 We’ll put some extra soil on top in the next photo…. 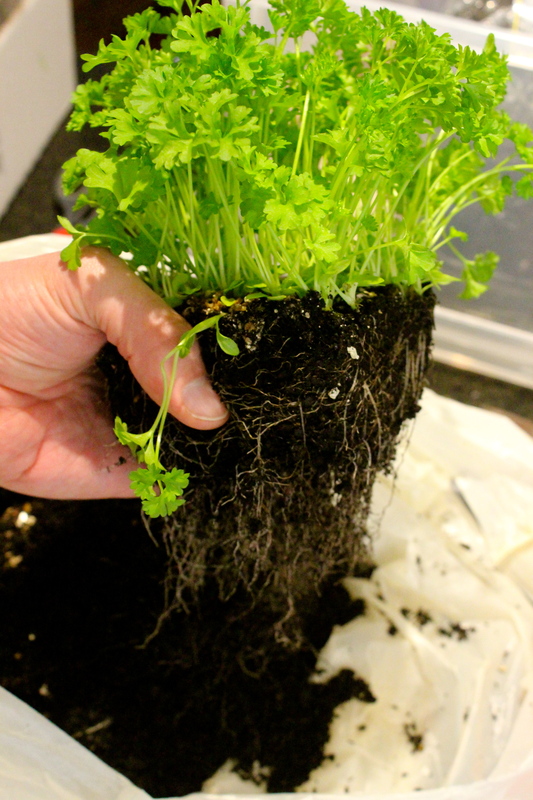 Top up the soil around the base of the plant to bring it level with the top of the pot. 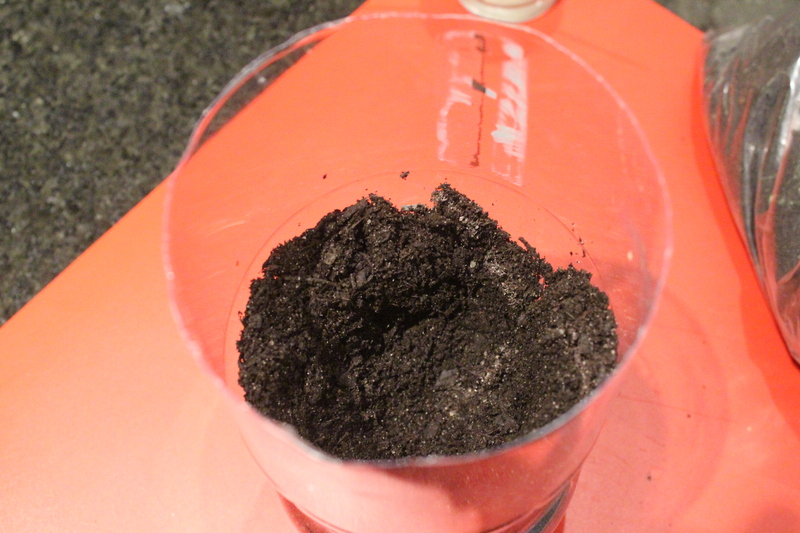 I specifically used the coffee/egg/tea mix I spoke about earlier (without as much soil). You can also put a thin layer of rocks on top if the plant is in a heavily sunny place – it helps to stop the water being evaporated from the soil. Once you’ve done that you’ll need to water the plant. 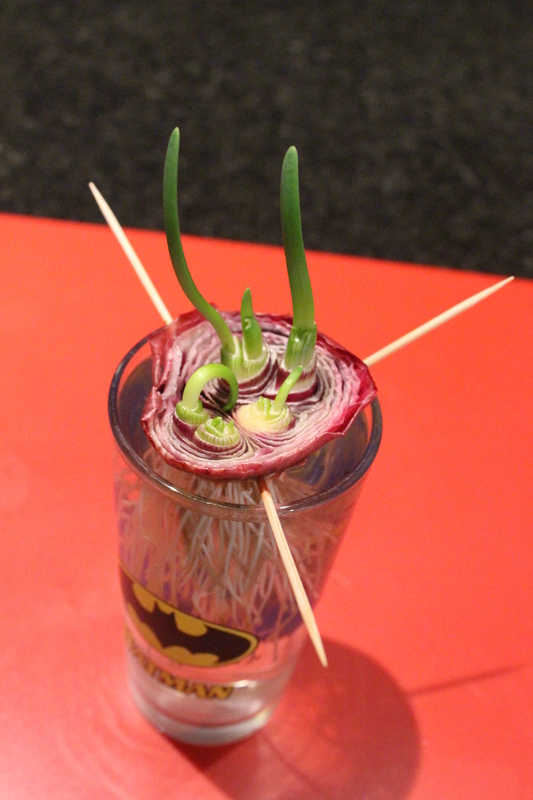 The best way is to submerge it. 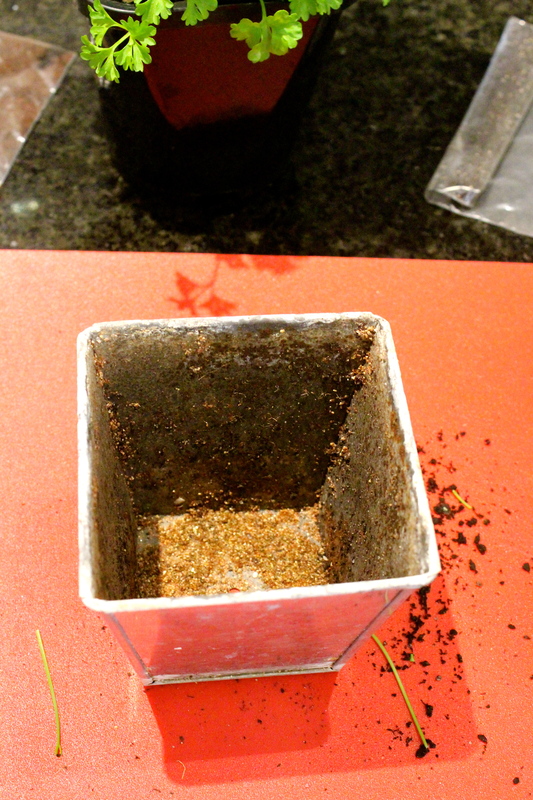 That way the water seeps into the container, rather than watering it from the top which just washes all the soil away. 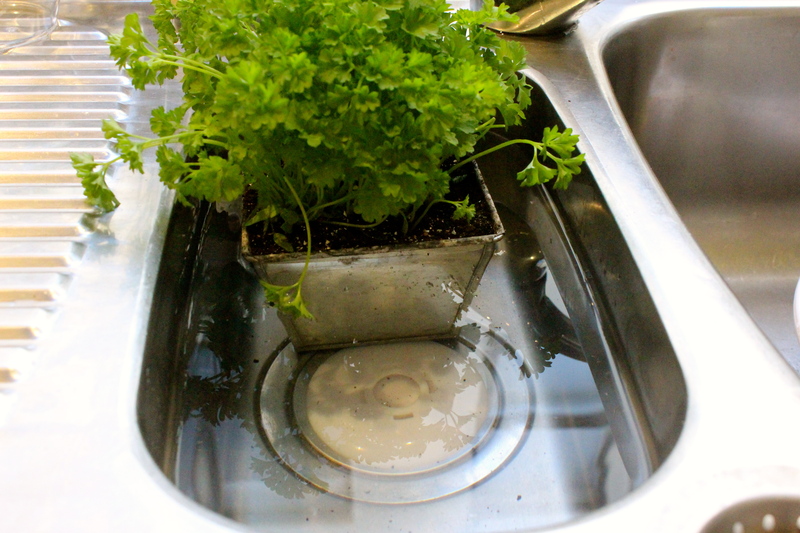 Just put it in the sink and fill the sink up with water until it’s level with the top of the pot. Let it sit until the top of the soil looks wet. 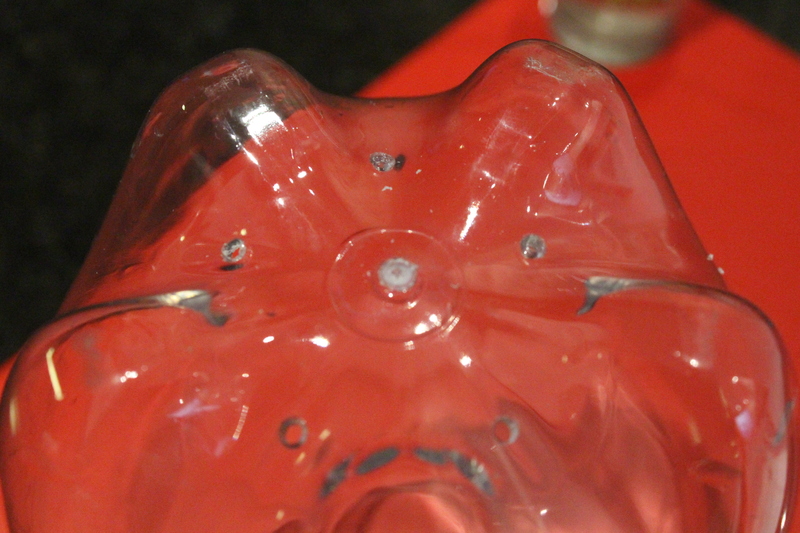 Then let it drain out. 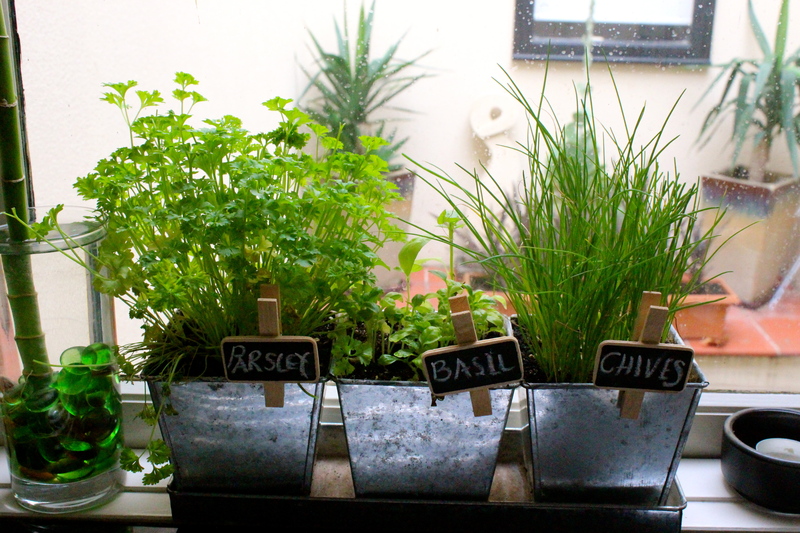 Place on the window sill with your other herbs and enjoy! The more you prune, the more they grow, so don’t be shy. If you use too much, just buy more and replant them! You can see the level of growth over the next couple of photos. Enjoy!! Welcome to the first edition of Terrace Plant Thursday! 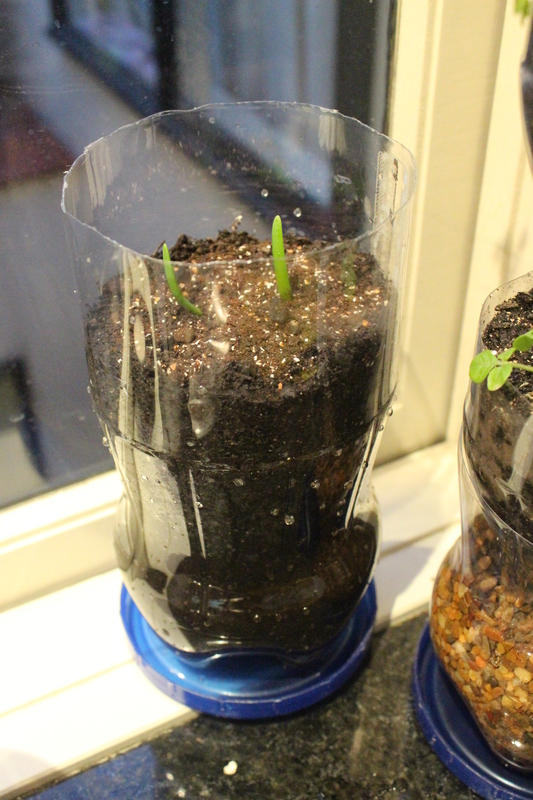 Over the next few months (or as long as I have material), I’m dedicating Thursday blog posts to gardening tips. The gardening tips that I’ll be focusing on will revolve around stuff that you can do if you very little space. From a window sill to a balcony or terrace/courtyard, these tips will let you be able to do gardening without needing a garden to do it in. Of course if you have more room you can always just do more of it! To start the whole thing off I want to talk about the soil that I use the whole way through this series, and in fact all the time. 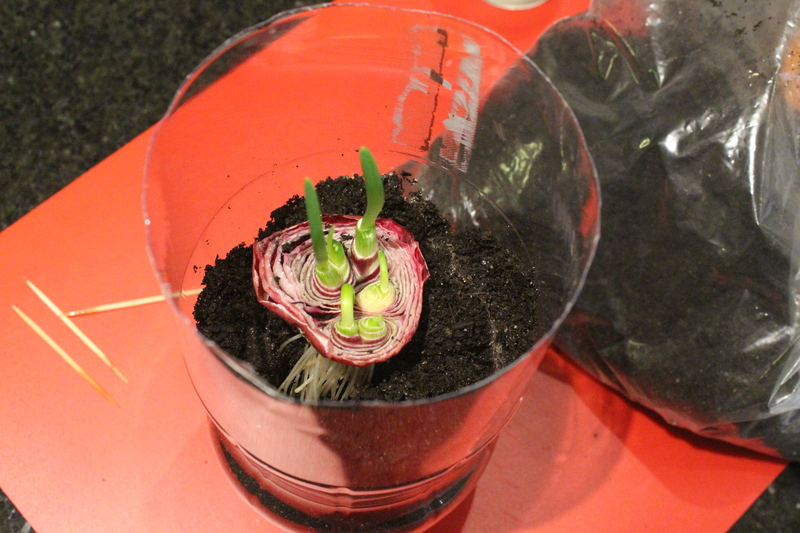 When you pot a plant, the soil is only one small part of the whole thing – you need fertiliser, water, the plant, etc. 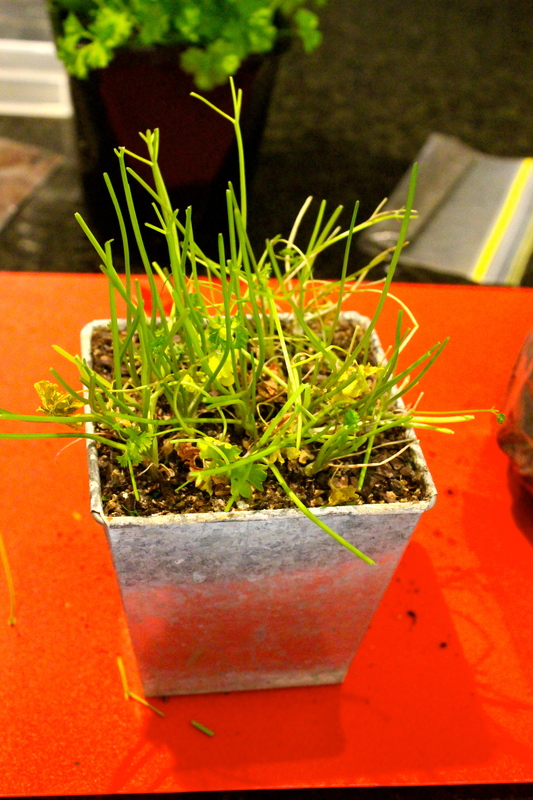 But, if the soil is nice and rich and the plant likes it, it really helps the growth. This is the secret to my special soil mix. What you see above is the key ingredients – egg, coffee and tea. Sounds weird, right? It’s not only great for the soil and the plant, but also for the environment. So everyone knows that eggs are high in protein and nutrients and that they help living things grow up to be big and strong. Plants are living things! 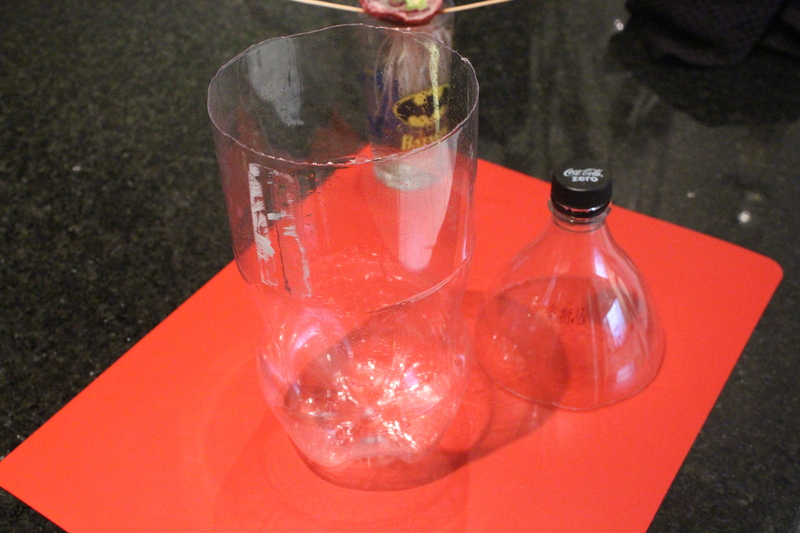 I came to a point where I got sick of throwing away so many egg shells and wondered if I could do something else with them. I researched a bit on the net and found that throwing them in the compost is great. However, I can’t have a compost bin because my flat has nowhere to put it. Then I remembered that a friend of mine throws his egg shells into a pestle and grinds them up with a mortar to get them to almost a powdery state. 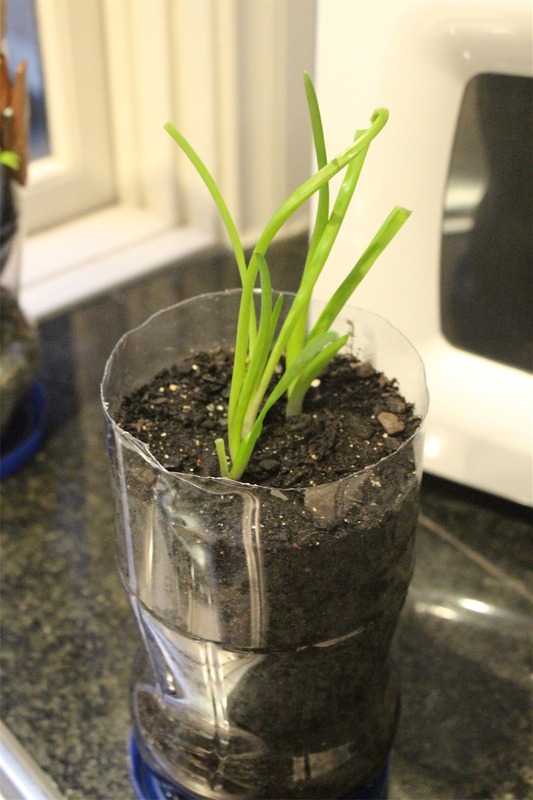 I looked this up and apparently this is a great way for the egg shells to deposit their rich nutrients into the soil and into the growing plants. You have to make sure that you rinse out all of the white yolk and skin from inside the shells and then leave them to dry before grinding them up, though. Otherwise you end up with a papery type of skin in there and it doesn’t crush. I love my coffee and I have a great coffee machine at home that makes great drip filter coffee. Again, I got sick of throwing out all of the coffee grinds and wondered if there was something else I could do with them. Because I don’t need that much for my plants, I just occasionally tip the filter contents onto some paper towel and leave it sit in the sun to dry out. 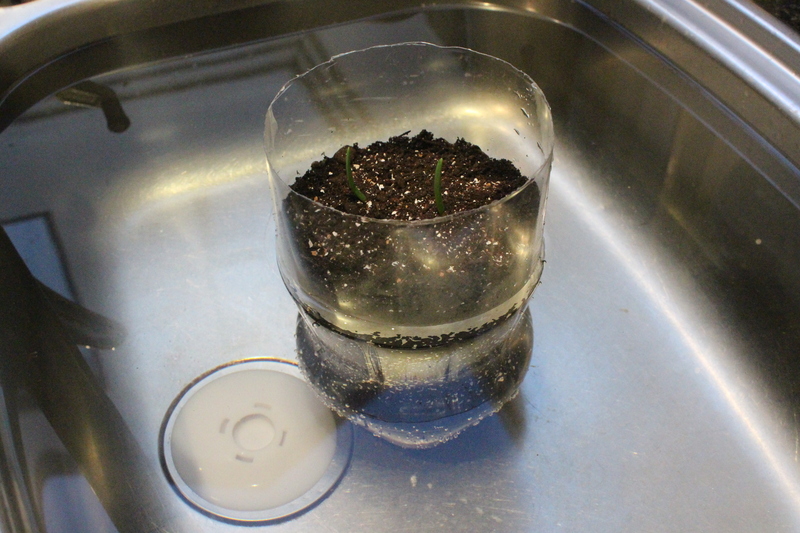 Then when it’s dry, I put it into a container and save it for later. 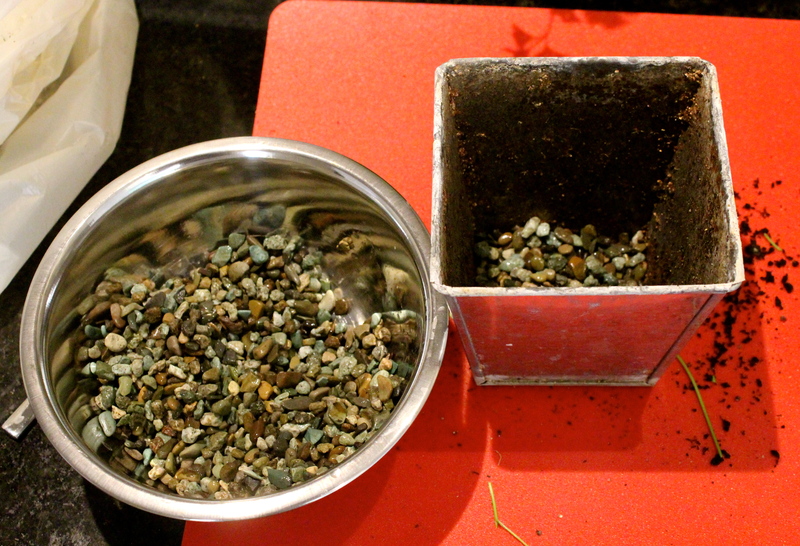 In my experience, I found that mixing coffee into the soil makes for a great rich nutrient meal for plants. 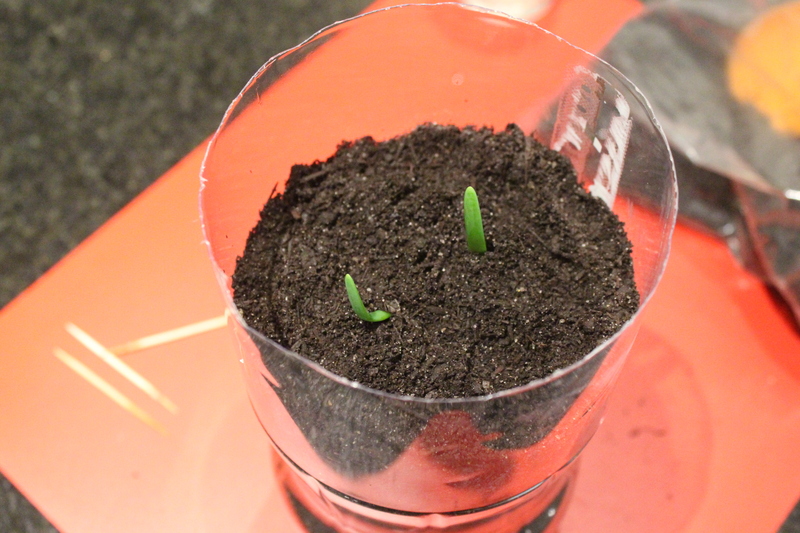 Seeds also love starting off in coffee – it’s easy to grow in, has nutrients and makes them shoot up really quickly! Okay, pretty much the same story as the above, but I hate throwing out the tea bags. I just open up the tea bags (black tea, not herbal stuff) and lay the contents out to dry like I do with the coffee. I haven’t really seen if this makes a huge difference, but it doesn’t seem to hurt and it’s recycling a tea bag here and there. 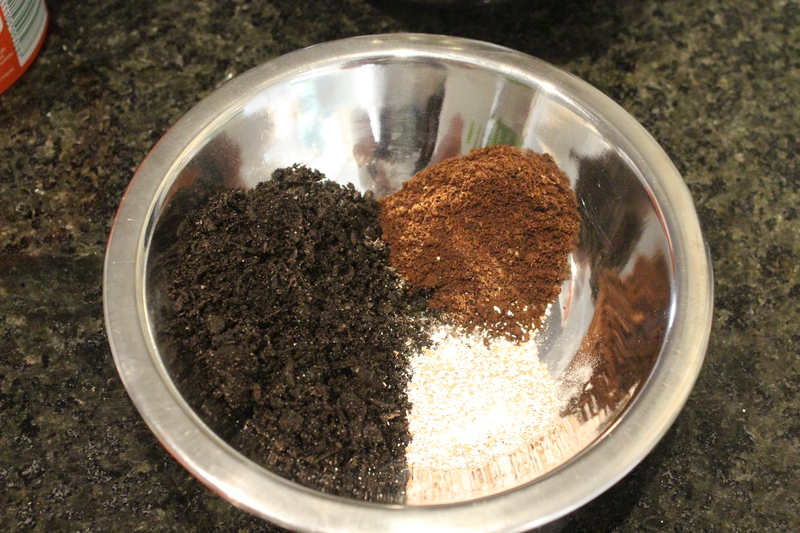 So, once you have saved up a bunch of these ingredients (the coffee and egg will do, the tea is a bonus), put them into a bowl and mix it all up. 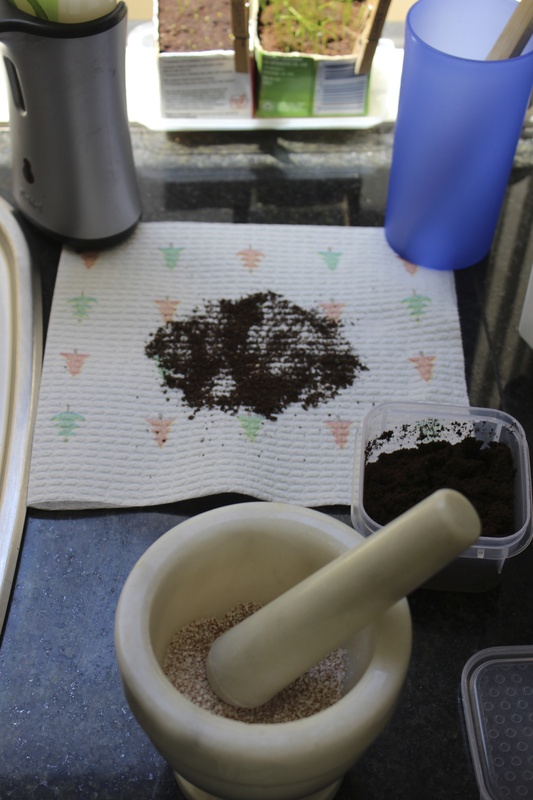 I usually put in a tablespoon of coffee, a tablespoon of egg “powder” and a cup of soil. It seems to be a nice mix. In the spirit of keeping gardening cheap, I use the cheapest potting mix I can find. The extra stuff makes it great, but I really don’t think it matters too much what sort of soil you use. 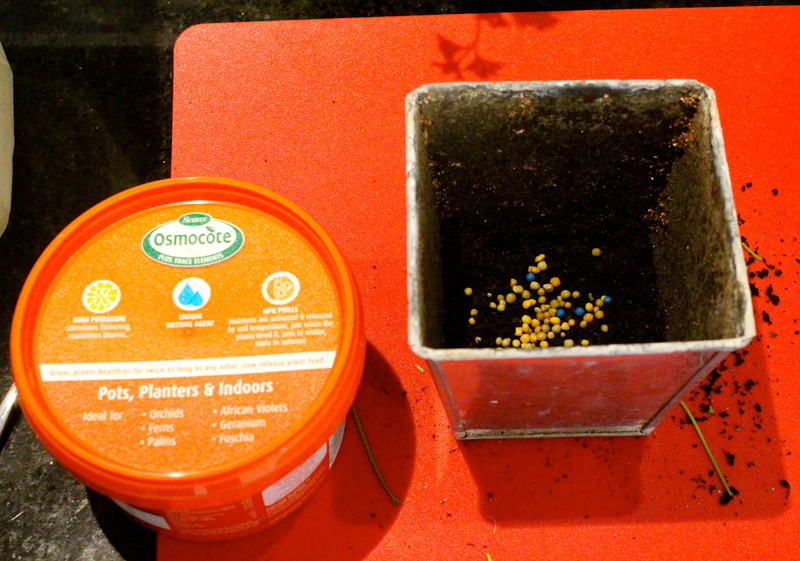 If you are potting seeds or bonsai, I would also suggest a tablespoon of sand, but it isn’t that necessary. I will be using this soil mix for all of my planting and potting through this series, so I wanted to get this out there first. 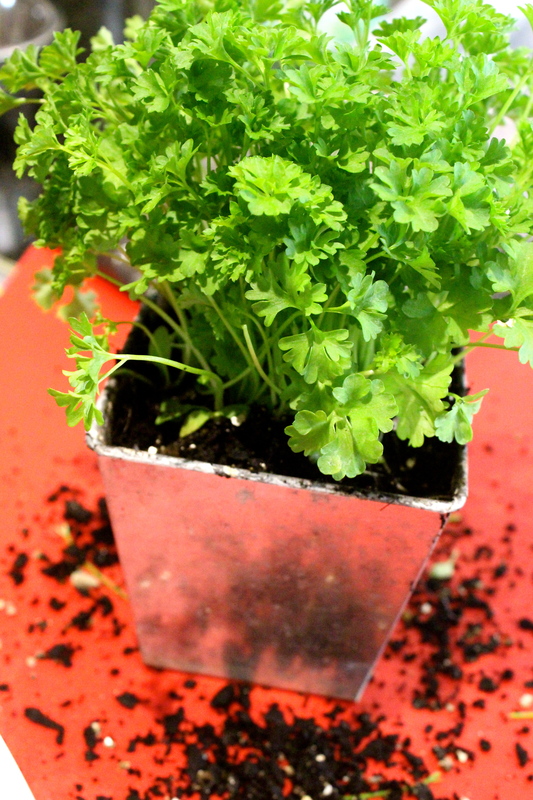 Thanks for reading – next issue will be about how to make your herbs tastier.